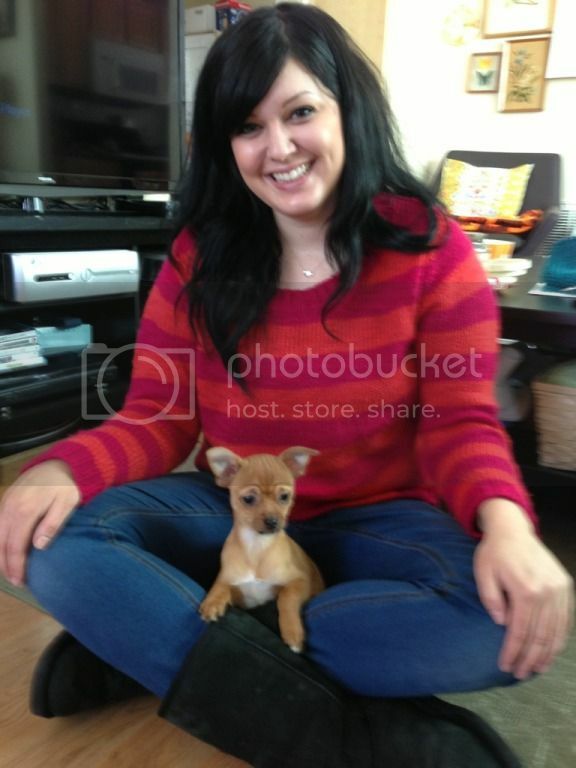 susannahbean: Meet our new girl! She is so cute!!! Congrats on your little addition :) my only puppy raising tip would be to invest in some bitter apple for when she starts chewing up everything (but hopefully you won't need it!) Good luck - she is absolutely precious!! Aww congrats, she is soo cute!! Yay! I need like 800 more pictures of your cutie. Congrats! So glad you went the adoption route! Good for you guys! Cricket is adorable! She is the cutest! I love her little facial expressions! She so has human eyebrows. I'm guessing the previous owners didn't have just regular milk at their residence? I mean...really? Maybe they watch too much Keeping Up with the Kardashians or something. gahhhhhh omg omg what a cutie!! i am so excited for you! i put mabel in my hoodies like that and would carry her around like a sleeping baby. congrats! She is just way too cute!!! Oh my goodness. Those eyebrows. Killing me. haha! We never had a puppy, but we had had our cat about 10 ten years when we brought home my Grandma's grown dog to come live with us (a Shih Tzu mix). Winter (the dog) was a pretty energetic gal and liked to jump around and get up in our cat's face, and since she was bigger than our cat, they never really took to each other. I mean, Winter couldn't have cared less, but our kitty would always just hiss and meow at her. She did start calming down more in her old age, so they started getting along better, but yeah, they never were able to sit together or anything. That may end up being the case here too, and also because your kitty is used to being the center of attention haha. But there's also a chance that since Cricket is smaller then Jeans, they'll get along just fine since there's no size threat there. Either way, it's great that Jeans has somewhere to go to feel safe! Very beneficial for him : ] I hope things work out well between them eventually though! She's absolutely precious! Love her name too! She's sooo cute! Also the boy wanted to name her Adventure Time? or Buckets? lol.. that made me giggle for a moment. Only a boy.. I love the name cricket! The story of the mama is so sad but I'm glad that someone with some sense raised them and they got to stay together! I'm glad you adopted. So many pets without homes as it is. I wish they would just ban breeders altogether! So very, very sweet and so very much already at home. 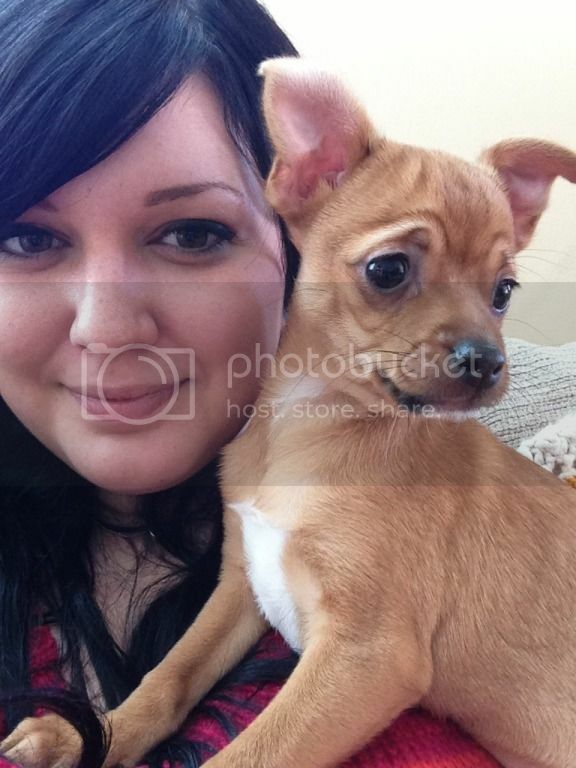 A chiweenie!! How perfect!!! I wouldn't be able to leave that cutie alone. And Cricket is a great name, congratulations! I have chiweenie too (I think). I know his daddy was a doxie but Mom was a bit large for a chi. Jake was raised and still has a playpen. We used puppy pads, had his food, water, bed, toys in the playpen and he loves it. That's his room at night and when we're not playing or sleeping with him. He used to have a yard to play in too but now we're in an apt. Our 2 cats get along fine with him too. He looks so cute! 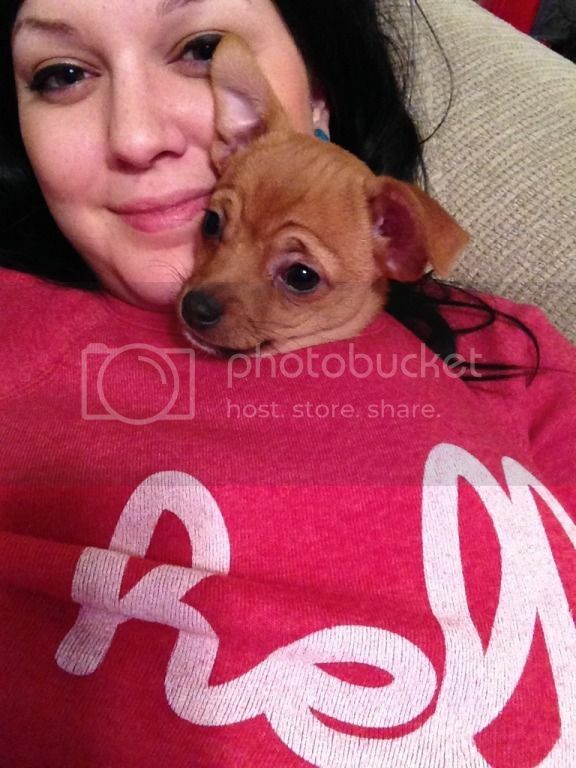 I didn't know something like a chiweenie existed, that word just adds even more awesomeness. Sweet baby, sweet baby, sweet baby!! SOO CUTE!! Oh what a cutie patootie!!!! She's so cute!! I really want to get a miniature poodle puppy, myself. I'm a sucker for their cute looks, and their temperament would be a really good fit for my lifestyle. I'm new to your blog, so forgive me if I'm wrong, but I'm assuming Jeans is a cat? My family got a lab several years ago, which entailed introducing her to my 10+ year old cat. Lol! I was so proud when my cat finally got used to her and would allow herself to sit next to the dog! Apparently you can teach a cat new tricks! adorbs!!! she looks like she is constantly worried with those eyebrows!! haha perfect puppy!!! oooh she is sooo cuuute!! Adorable puppy!!! I miss reading your posts! You've been gone for a little while, I check from time to time to see if you're back yet with any updates on Jeans and Cricket! I love your puppy! I have a little Min Pin and they look pretty darn similar only my little Lucy is chocolate. Dog's truly bring you so much joy!!! I love your crochet work. I crochet too! In fact it seems that we may have a lot in common in the crafty department. I would love for you to check out my blog and see my Big Cartel Shop. I switched from Etsy because Etsy is just so big I felt I was getting lost in the mix. I adore your work darling!